technology for the metalworking industry worldwide. 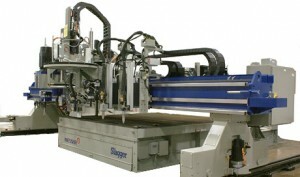 We have perfected machinery for both straight and bevel plasma cutting to ensure the quality, reliability and efficiency of your cutting process. 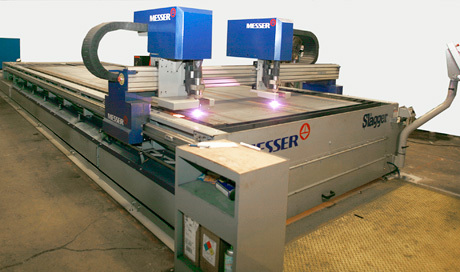 Please contact us today for more information and get a free quote on our Messer plasma cutters. From shipbuilding to the electronics industry – Our product range is just as multifaceted as the tasks presented to us from the wide range of industries we serve. Our customers come from steel and metal working, machine tool and agricultural machine production, chemical, food, and pharmaceutical industries. 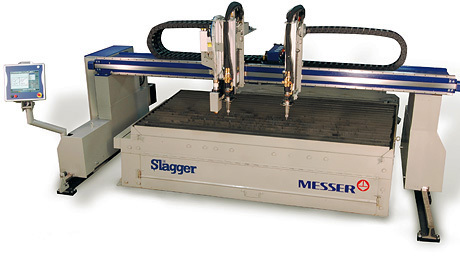 To the manufacture of automobiles, ships, railways and electronic products, right up to medicine, research and environmental technology Messer Cutting Systems can fit your needs. 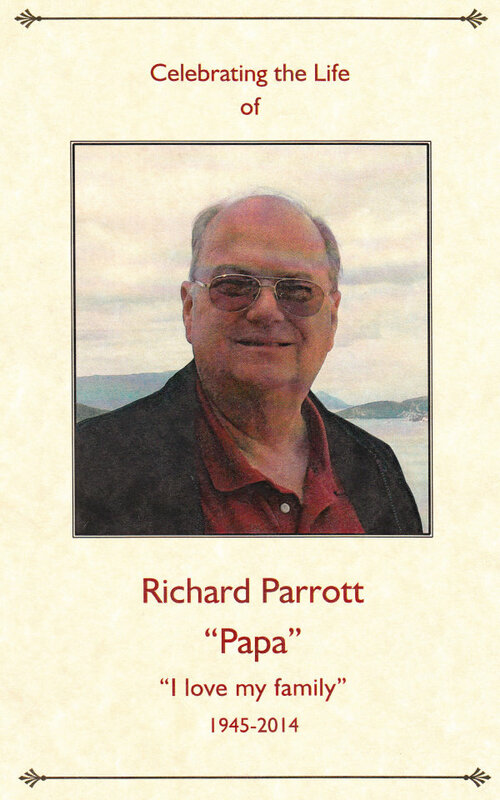 Often you need a supplier for small but decisive details here. We love these fine details as much as our large projects. For all different kinds of customer requirements Messer Cutting Systems supports them with technical and applications training. 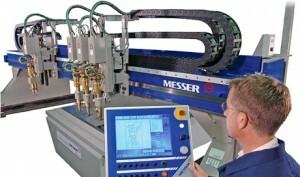 To concentrate totally on the decisive technical innovations for your facility let Messer Cutting Systems help you. The PlateMaster offers a rugged steel, dual drive box beam gantry with heavy duty floor mounted rail system. Available in widths from 8’ to 14’, and lengths from 10’ to 80’, it travels at an industry leading rapid speed of 1000 IPM. Cutting stainless steel, mild steel, and aluminum; the PlateMaster can cut gage up to 12”, (305mm) and can utilize plasmas up to 400 amps. It provides maintenance-free digital brushless AC drives, providing smooth motion and accurately cut parts. Affordable, accurate, and efficient, the PlateMaster provides high quality cutting solutions. The EdgeMax sports a rugged unitized steel table/frame, full capture bearing assemblies and a low mass aluminum beam driven by dual brushless AC motors, providing fast acceleration, precise motion and a very stable cutting platform. Powered by the Messer Global Control S with touch screen interface and the familiar Windows® screen layout, novice operators quickly master the machine. Coupled with Messer’s Virtual Service, real-time direct applications help is available to new operators and programmers providing quick, accurate and complete answers to process and operational questions. The MetalMaster Plus is a unitized table and gantry cutting machine that utilizes conventional & precision plasma processes up to 400 amps. It produces excellent looking parts for the precision fabrication market. This unitized design of the MetalMaster Plus incorporates an all-in-one precision high speed cutting gantry and a self cleaning table that superior part accuracy and quality. HPR400 Precision Plasma is suitable for mild steel, stainless steel, and aluminum from 26 gauge to 2” (50.8mm) thick. 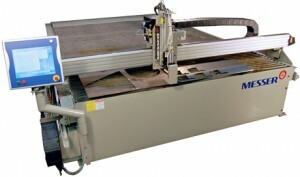 A side draft exhaust cutting table is included with the machine, which can also be upgraded to a Slagger® self-cleaning table. The MPC2000 is a multi-process Messer cutting machine that can be equipped with multiple carriages and up to five separate processes including precision plasma, conventional plasma, oxyfuel, drill and markers, all on one machine. The newly redisgned MPC2000 features newly enhanced linear ways, long-life band drives and larger end trucks. It provides high accuracy, repeatability, and durability. A total of four separate tool stations may be installed. 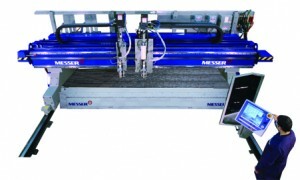 It is able to deliver clean smooth cut edges and precisely cut holes at very high accuracy and repeatability. The MPC2000 includes linear motion ways and state-of-the-art AC servo drives to provide dependable machine tool performance. The rugged double beam construction makes it tough enough to keep cutting, even through three shifts and offers the strength and stability for maximum accuracy and repeatability. Our Titan II gantry system features multiple processes that yield superior part quality affordably. This machine supports beveling in Plasma and Oxyfuel, including the Rotator Delta Plasma Bevel. Available in widths from 8′ to 14′ and lengths from 6′ to 100′. The Titan II is a gantry type cutting system that supports a variety of cutting processes and produces superior cut part quality. Up to eight torch stations may be installed on the Titan II to increase productivity. The machine’s AC Servo drives produce smooth motion at either end of the speed range. Whether cutting at low speed for thick sections with Oxyfuel, or high speed for superior Plasma cutting, the Titan II’s powerful Windows® based Global Control S makes it easy to learn and to use. The pre-programmed shape library allows creation of over 200 different shapes. The TMC4500ST is built for state-of-the-art performance in the rigorous environment of fabrication shops and service centers. Box beam steel construction results in a stiff backbone to the gantry frame. Hardened and ground ways support even the heaviest cutting carriages and provide long life. X-Axis rails are machined from tough 115 lb./yd. crane rail to support and guide the cutting operation. 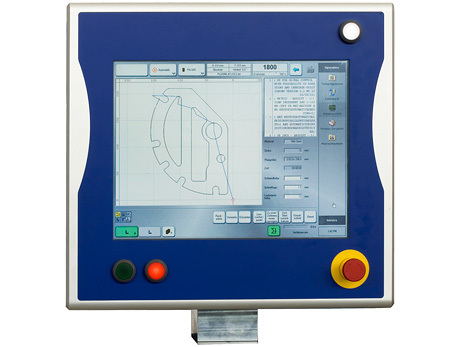 The TMC4500ST comes with the Global Control Plus, the most advanced CNC control system on the market with intelligent dialog windows for data input, multi-tasking capability and a programmable shape library, the system can control up to 12 axis of machine motion. The Global Rotator Infinity Plasma Bevel Unit with continuous rotation and torch positioning to +/- 52 degrees is capable of accurately cutting bevel profiles (non-vertical) on nearly any contour. When the TMC4500ST is programmed to cut at a bevel angle, the cutting current and torch stand-off are controlled by the same NC part program. The system is used to create bevels for weld preparation surfaces or for active cutting edges as used on earth engagement tools. Bevel and Land edge configurations can be created via multiple passes. The Global Control S provides a broad range of options, productivity, and ease of use. It fits to all straight oxy-fuel and plasma processing and. It includes Ink-Jet, Powder or Plasma Marking. Global Control S is the new standard control for Messer Cutting Systems and Welding’s Distributor line. Features of the Global Control S include nesting, remnant tracking, consumable selection, auto gas setup, and a parts database. GlobalControl S with its super graphics is easier to use than your TV set! The user interface is very clearly laid out with easily understood symbols, photos, graphics and the well-known Microsoft tree structure. Everyone understands this control simply intuitively. GlobalControl S with the most modern data bus technology reacts quickly and accurately to your input. Simply enter your commands via touch screen. The control and monitoring of the drives also gives top dynamic performance. The Global Control Plus provides a broad range of options, productivity, and ease of use features. 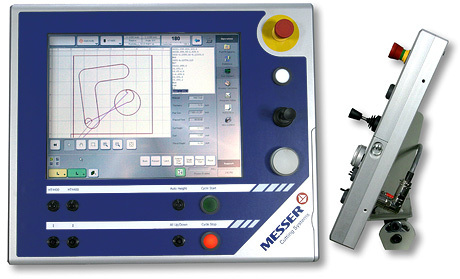 It offers the high quality standard control for Messer Cutting Systems’ Precision and General Fabrication lines. Some features of the Global Control Plus include extensive custom shop library, on-board plasma and oxyfuel database, Virtual Service, CAD import and true-shape nesting. Global Control Plus with its exemplary graphics is extremely simple to use! The user interface with a consistent operating concept is very clearly laid out with easily understood symbols, photos, graphics and the well-known Microsoft tree structure. Everyone understands this control simply intuitively. Global Control Plus with the most modern optical fiber Bus reacts quickly and directly. You can count on the shortest response times to your commands whether input via touch screen, joystick or hand wheel. The control and monitoring of the digital drives also gives top dynamic performance. Global Control Plus with Bus system, data bases, macro nesting and many other features offers simply more! Complete networking capability, 3 level database for all cutting processes even down to consumables, all peripheral systems, all equipment right up to infinitely rotating bevel cutting units: Which cutting control offers more? The Global Control for all oxy-fuel and plasma processes, bevel cuts, all marking processes. The most modern optical fiber Bus reacts quickly and directly. The novel Control concept improves your productivity.